RIHE was established in 1972 as the first specialized Research Institute for Higher Education in Japan. It has evolved into a center for current research and information exchange among domestic and foreign researchers and also fulfills national roles through its series of publications, research conferences, information services, and its extensive library facilities and holdings. It aspires to be a focal point for emerging networks of higher education research organizations and institutions worldwide. Since its establishment, RIHE has provided both a focus and a forum for research on higher education in Japan. As of April 2019 the Institute has nine academic staff members: four professors, three associate professors, one specially appointed professor, and one lecturer. The post of visiting professor was established in 1996 to which non-Japanese researchers are appointed. 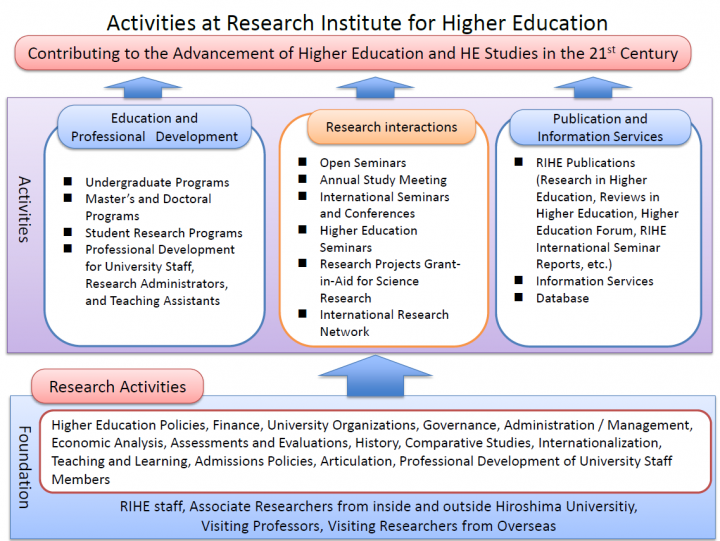 In addition to the full-time researchers at RIHE, over 550 associate researchers from inside/outside Hiroshima University are actively linked with the Institute. Its annual study meeting, which was initiated in 1972, attracts not only the associate researchers but also other researchers and administrators from different parts of Japan every year. 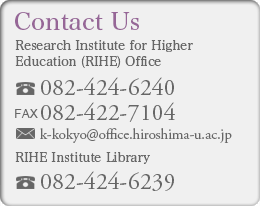 In 2002, RIHE was designated as one of Hiroshima University’s four Advanced Research Institutes. Within the University, it serves as the center for the study and analysis of institutional reforms and development. RIHE is also extensively engaged in diverse international activities. Major international conferences, in collaboration with OECD, UNESCO, Eight-Nation Education Research Project, and the Changing Academic Profession Project (CAP) have been held. RIHE acted as the coordinating agency for the Eight-Nation International Survey of Higher Education. Other current international projects include collaborative studies with centers for higher education research in Australia, China, the Netherlands, the United Kingdom, and the United States. RIHE’s research reports, books and journals are published in both Japanese and English. As official recognition its long-standing efforts, RIHE was selected by the Ministry of Education, Culture, Sports, Science and Technology (MEXT) as a member of the 21st Century COE Program in 2002-2007. Furthermore, we have been funded by MEXT to continue the strategic research project on university reform for the 21st century (2008- ). RIHE is currently offers two graduate programs in higher education: the doctorate (Ph.D.) and master’s (M.Ed./M.A.). These programs were originally established in 1986 as the first graduate programs for higher education research in Japan. RIHE’s programs have two main purposes: to train researchers in higher education and to educate university administrators and staff. The institute is actively developing programs to meet the needs of these two groups. Our programs are characterized by delivering basic foundation courses, followed by more challenging and detailed professional ones. By the 2018 academic year, seventy-two M.Ed./M.A. students and fifteen Ph.D. students from diverse backgrounds have completed RIHE programs. From its inception the Institute has had the goal of establishing an extensive library for research in higher education. Its collections include journals, monographs, research reports’ and reference materials, and university and government publications covering all areas of higher education in Japan; other Asian countries and many holdings from American and European sources. Its library is now recognized as one of the leading libraries of higher education in the world. RIHE now disseminates information worldwide thorough a variety of means, including the Internet. RIHE functions as the central node of a network of research researchers in higher education nationally and internationally. Co-operation and support for research initiatives are provided through domestic and international conferences, publications, and the visiting scholar program. RIHE has been a main member of the National Association of Institutes for University Education to link its now 37 members. RIHE was also instrumental in founding an academic society: the Japanese Association for Higher Education Research. Within Hiroshima University, the Institute serves as the center for the study and analysis of internal reforms and development. Continuing programs include faculty development, staff training and quality assurance of university education. Much of this work has been extended to other universities in Japan through commissioned collaborative studies in relation to national programs for university reform. Graduate courses in higher education were established in the Institute in 1986. Since 2000 both master’s and doctoral courses have been expanded and made available through the new Graduate School of Education. Provisions exist to admit both full-time and part-time students and students including from overseas. Seminars in which important aspects of academic careers are discussed are provided for graduate students. An “Open Lecture” system enables members of the University and the public to attend lectures and seminars given by both visiting and resident scholars. RIHE’s research activities include major international and national programs. The institute serves as the coordinating agency for the Eight-Nation International Study of Higher Education and other current international projects include collaborative studies with centers in Australia, China, the Netherlands, the United Kingdom, and United States. The national program of research for the new Center of Excellence is outlined separately. Research interest areas of full-time members of the Institute are indicated on the “Staff” page.